Ryan Donato has played two games for the Bruins, and has two goals and two assists. 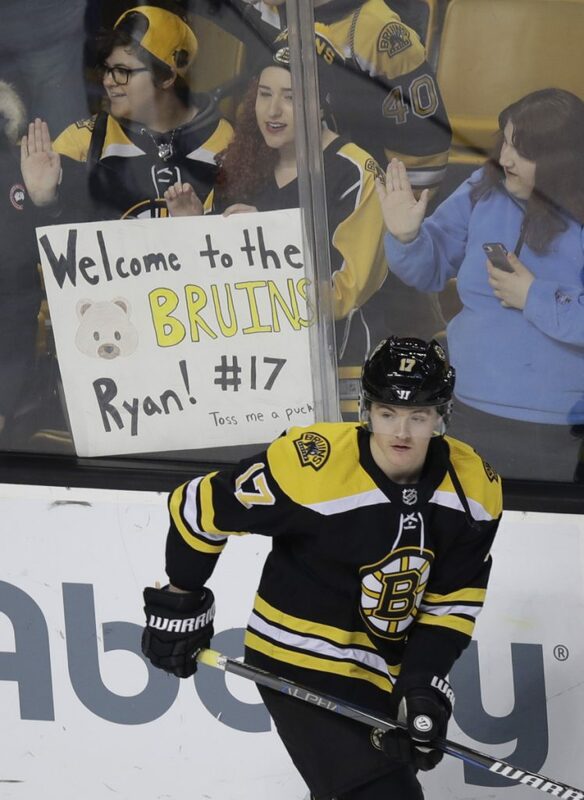 ST. LOUIS — Rookie Ryan Donato, allowed to miss the team flight on Tuesday morning to take care of some prior commitments for his schoolwork at Harvard, made a late flight Tuesday night and was in the lineup for his first NHL road game Wednesday night. Donato is trying to finish his junior academic year as he looks to complete his degree in sociology. Donato, who signed with the Bruins on Sunday after Harvard was eliminated from the ECAC tournament Friday, said he has most of his classes on Tuesdays, so that’s why he stayed back in order to speak to all his teachers in person. “I’m just going to do all the schoolwork I need and turn in every paper on time,” said Donato, who scored in the Bruins’ 2-1 overtime loss to the Blues on Wednesday night. The point for the OT loss clinched a playoff spot for the Bruins. In two games, Donato has two goals and two assists. RED WINGS: Defenseman Mike Green will have season-ending surgery on his cervical spine. FORMER NHL forward and coach Eddie Olczyk is cancer-free after months of treatment. The 51-year-old Olczyk made the announcement during the first intermission of Thursday night’s Canucks-Blackhawks game. Olczyk is a color analyst for TV broadcasts for the Blackhawks and NBC Sports. Olczyk was diagnosed with colon cancer last summer. He said he was told on March 14 that his scans were clear. LIGHTNING 7, ISLANDERS 6: J.T. Miller scored twice, Brayden Point had a goal and two assists, and high-scoring Tampa Bay won at New York. BLUE JACKETS 4, PANTHERS 0: Sergei Bobrovsky stopped 33 shots for his fifth shutout of the season, Cam Atkinson had a goal and an assist, and Columbus beat visiting Florida for its 10th straight victory. Sonny Milano, Seth Jones and Thomas Vanek also scored. HURRICANES 6, COYOTES 5: Jeff Skinner scored his second goal with 1:58 left, and Carolina beat visiting Arizona despite giving up a weird goal when the puck stuck in goalie Cam Ward’s skate. Skinner added an assist, and Valentin Zykov scored two goals, the second tying it at 5 with 10:14 remaining. Phil DiGiuseppe had a goal and two assists, and Jaccob Slavin had three assists. Rookie Clayton Keller had a goal and an assist, Josh Archibald and Nick Cousins also scored, and Darcy Kuemper stopped 24 shots for Arizona. FLYERS 4, RANGERS 3: Travis Konecny scored twice, Claude Giroux had three assists and Philadelphia beat visiting New York. Jakub Voracek had a goal and an assist, and Oskar Lindblom also scored for the Flyers. Jesper Fast had two goals and an assist, and Mika Zibanejad also scored for New York. CAPITALS 1, RED WINGS 0: Philipp Grubauer made 39 saves for his third shutout of the season, and Brett Connolly scored on a third-period breakaway to lift Washington at Detroit. The Capitals have won 6 of 7 and lead Pittsburgh and Columbus by four points atop the Metropolitan Division.